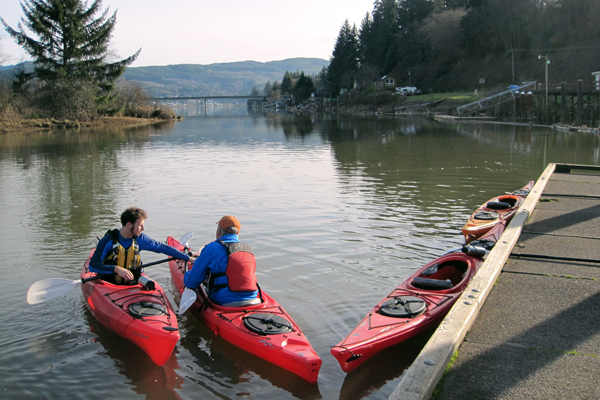 Behind a small island in the Nehalem River is a discrete little dock which can launch you into the rarely paddled backwaters of the North Fork! Come with us and get lost in a world of gentle waters that flow through stands of old Sitka spruce, distant grasslands and networks of forested sloughs. Sightings of bald eagles are common here and you are likely to discover the markings of elusive but busy beavers which are only seen with luck and a silent paddle stroke. The nearest food and lodging can be found in the cities of Manzanita, Nehalem and Wheeler.